Being the first foreigner teacher ever at their school was a big deal to some of the students. I had spent the two-day travel time from Los Angeles International Airport to Chengdu, Sichuan, with a fellow Peace Corps China trainee who had six years’ worth of Mandarin under her belt. We had lunch together in the city after arriving and after that, I was on my own. A nauseating fear overtook me when I first walked up to a hole-in-the-wall steamed bun vendor in the middle of the metropolis to order lunch. I held up two fingers to signal I wanted two buns. A Sichuan dialect poured from the vendor’s mouth and I stood in a stupor. It took a few minutes for him to deliver the “Which two buns?” message. A line formed behind me and I started sweating. I pointed to the nearest collection of buns and he held up three fingers for what I owed. I paid and dashed back across the street to the hotel. Two weeks later, I moved in with my host family while attending Peace Corps training. My sister spoke some English, my parents didn’t speak any and we trainees were just learning the basic pinyin (phonetics) of Chinese. I was at the gym every day at my site. 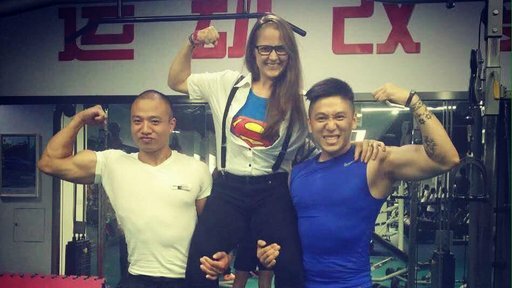 The gym coaches and my friends were so supportive and often called me "Superwoman" or, in pinyin, "nu chao ren." For Halloween, I dressed up as Superwoman just to give them a laugh. I wished that too. Soon I would be moving to Chongqing, where I had no one to teach me but myself. It was also in Chongqing that I would join a gym, make new friends, connect with my students and learn what I was capable of. No matter her belief in me, there is nothing quite like that feeling when you realize your students’ comprehension level is much lower than you expected. That moment, I wondered if I was crazy for doing this at all. I threw away the syllabus I worked so diligently on, went home to mope and then devised a new plan. My desire to connect with people was stronger than surrendering to failure. I didn’t know how much learning the language would help me connect with my students or friends as well as understand culture. I used my monthly language stipend to sit at Starbucks, drink coffee and study Chinese every day. When life felt difficult, uncontrollable and unbearable, I moseyed on upstairs to the gym to work out, which was the only thing I could control. Because I was the first female foreigner to set foot in the gym, that made me interesting. It also gave me a surplus of friends who were willing to chat with me and be patient with my slow learning curve. My friends and students used messaging apps WeChat and QQ to communicate with me. They sent text and voice messages in Chinese and I would respond using pinyin and so-so pronunciation. That was my first valuable tool at learning how to read and write characters, as well as listen to Mandarin and the Chongqing dialect. Slowly, I started to learn and I became obsessed with developing my skills. The gym became the place I developed my language skills most. After over a year of committing to the gym each day, they allowed me to volunteer teach Zumba every Friday for the rest of my service. After six months, something clicked. I was able to recognize speech patterns and ask what a word meant. I sat in my office and listened to teachers talk to each other, noticing patterns and asking questions. I even took up a textbook called Boya Chinese to extend my learning. I kept track of new vocabulary using the Anki flashcard app, and studied on planes, trains and buses. Before I knew it, I was having simple conversations with the people closest to me. I could even understand the regional dialect and slang of my students. They loved when I spoke the regional dialect back. When I swore into my service, I scored a novice-high level. Upon completing my service, I scored an intermediate-high level. So much factored into my success: my support systems, my motivation, my stubbornness to never give up and my program manager, who believed in the greatness within me. People ask me how I learned a language so quickly. I didn’t have a choice and the environment had a lot to do with it. I didn’t have access to much English during that time, and I subconsciously placed myself in situations where I would struggle using only what I had. I wanted nothing more than to speak with my students and in the process, I made some great friends with the coaches of my gym. I even shared conversations about life with my baba. My service was the greatest lesson of my life, one that humbled me to the core and taught me the meaning of listening. 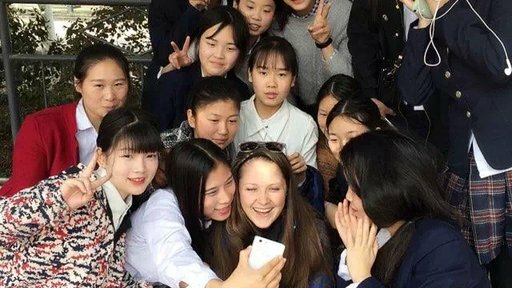 Kelly Branyik is a Colorado native who served as a TEFL instructor to high school students at Chongqing Tourism School in Chongqing, China. During her service, she taught Zumba at her local gym, created the first English Corner at her school and managed the Peace Corps Rice Paper publication for a term. Kelly chronicled her Peace Corps experience through her blog, Propitious Panda.